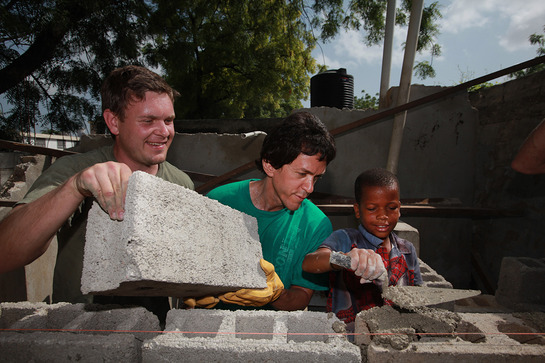 Bestselling author Mitch Albom is on the ground right now in Haiti with a group of volunteers from Detroit to rebuild the Sharing and Caring Orphanage in Port-au-Prince destroyed by the earthquake. Mitch has visited the orphanage twice over the past two months and committed to raising the funds (more than $82,000 over the past six weeks!) to make the orphanage livable again. Mitch and his team of volunteers arrived in Haiti on Wednesday and have been hard at work to repair the devastated orphanage. The orphans look on as Albom and volunteer Jolince Leger mix cement to lay new foundation for the building. 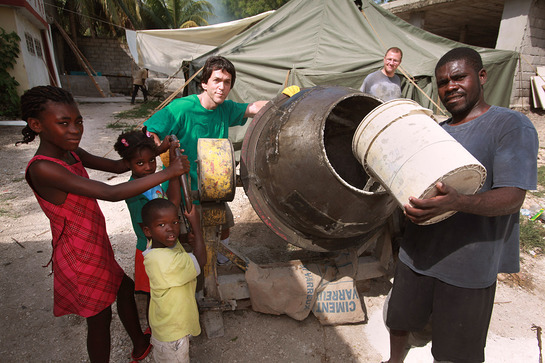 Here, Mitch and his group of volunteers from Detroit, including Matt Mosher, 28, are laying foundation as they continue rebuilding the Caring and Sharing Mission in Haiti destroyed by the earthquake. The group, known as the Detroit Muscle Crew, have been in Haiti all week volunteering their time and skills to make the orphanage livable.